A Severe Thunderstorm Watch is when a thunderstorm is likely to occur. A Severe Thunderstorm Warning is when a thunderstorm has been spotted, and people in the path of the storm are in harm’s way. Most thunderstorms in our area occur in the springtime. However, thunderstorms can occur at any time during the year and there are several things you can do to help eliminate severe damage to your home and to your family. Periodically cut down dead trees and clear loose branches from around your house. Secure or store loose outdoor objects such as patio furniture and garbage cans. Close all windows and secure the doors. Have a battery-powered radio on hand with working batteries to listen to weather-related news updates. Be sure that your family has a plan to move to a safe area in your house in case a thunderstorm has strong winds associated with tornado activity. Do not use a corded telephone, except in an emergency situation. Cell phones and cordless phones are okay to use during a storm. Stay alert to news updates. Never stand under a tall, isolated tree, on a hilltop, in an open field, on the beach, or near open water. If swimming or boating, get out of the water immediately and take shelter. Stay away from metal equipment and apparatus such as fences, tractors, pipes, and bicycles. If in an open area, move to a low spot such as a ravine or valley, but be aware of flash flooding. If in a forested area, take shelter under a thick growth of small trees. 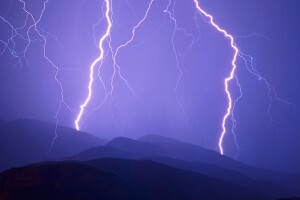 Lastly, if severe lightening strikes around you before you are able to get to safety, make yourself a small target by squatting down on the balls of your feet (do not lie flat on the ground), place your hands over your ears and tuck your head between your knees. Stay that way until the lightening stops. Your Fire Department is just a call away if you need help during a thunderstorm. If an emergency occurs, immediately dial 911.